9. Diversity: the sum of the yields in a mixed system will be larger than in a monoculture. Stability is produced when elements are cooperating. Not the number of elements is central, but their functional connections. It can be summed through the examination of the dynamic interplay of order and chaos, entropy, tidiness, control, and creativity. Guilds: areclose associations of species around a central element. Rely on composition and placement of species, which benefit each other. They aid in reducing root competition, providing physical shelter, providing nutrients, and assisting in pest control. create conditions of life-enhancement so that a system functions optimally at all times. A model of “efficiency” was institutionalized over the 170 years when it comes to farming and the result has been anything but efficient. On the contrary, it has been rather disastrous. Assuming that we examine two adjoining plots of land, 1 HA each with differing models of growth. One is the monoculture of say corn, wheat, or even apples. The other is a mix of small gardens, row crops, animal systems, tree crops, perennial vegetables, herbs, bees, butterflies, mammals and birds. The former uses chemicals or high uses of energy to stabilize the system, while the other uses natural checks and balances and the inherent order displayed in regenerating systems. The monoculture may outcompete organic systems, although the Rodale Institute would argue otherwise, in the lbs/acre or kg’s/ha. However this comes with a cost, a minus sign that unfortunately is ignored with the cost of food or the regulations. Soil is lost, bird life is jeopardized, and human health is marginalized for the profits of the ever needing expansion of GDP and profit sharing that is the capitalistic model. Meanwhile energy is built in the opposing system, a greater caloric input is achieved, and natural capitol is built through a creative cultivated ecology known as Permaculture. For temperate zones, the following pictures show some common plants that are grown with the idea of a woodland edge that suburban gardens can represent beautifully. Arranging them in and amongst other flowering natives, perennials, and annuals makes a diverse landscape while reducing our need for the global food system that wastes up to 50% of all shipped produce. Also much of our current food has been modified in various ways to improve different qualities like shipping ability or ability to be sprayed with pesticides yet not dying, but unfortunately we really haven’t had a focus on improving nutrition quality. However the below plants have more of a wild flavor and the resulting residual nutrition qualities that are pointed out in the pictures. 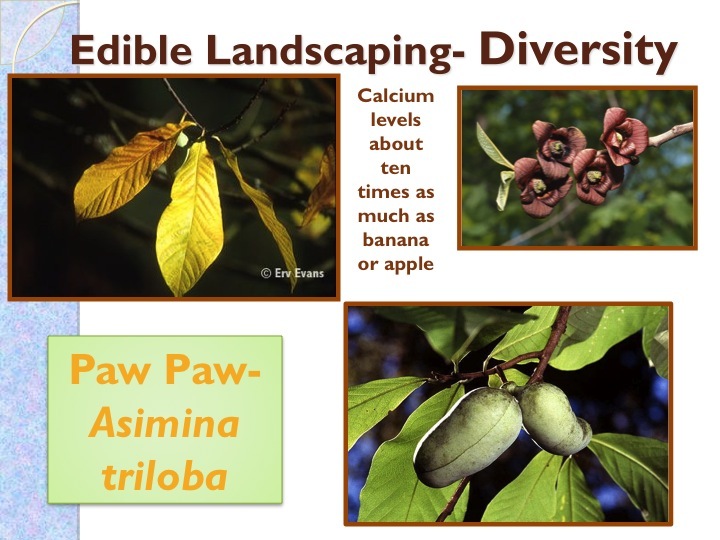 North America’s largest native fruit, the Paw Paw (Asimina triloba), is a wonderful addition to any temperate, humid climate garden. Its native range extend from Georgia to Canada meaning it can be grown in many locales especially those that have warm and humid summers such as Korea or Germany or of course the eastern half of the United States. It is the only temperate fruit from the Custard Apple family (Anona’s) and brings a tropical essence to the Permaculture garden with its large leaves. It has a quite unusual maroon flower that is pollinated in the spring by flies rather than bees as it flowers uses a mimicry system of rotting carion rather than a sweet aroma. However, don’t let this stop you from planting what the locals call Indiana Banana, Ohio Banana, Michigan Banana, or whatever state you are growing them in. It can be grown in full sun or shade while its native habitat is often along the edge of streams and fields. More sun=more fruit. Deer and goat resistance make this species a great option for increasing diversity without lots of hassle of protecting it from predatory herbivores. The delicious fruit ripens in the fall and when combined with the flour from another tree crop called mesquite a great smoothy can be enjoyed. Cultivated varieties are becoming quite popular as grafting of course speeds the time until you enjoy your first fruits. This tree is native to England and is a great addition to the home garden with its prolific flowers and abundant fruits. This plant has the remarkable characteristic that it is first to flower and last to fruit!!!!! It bears cluster of bright red fruits and can be eaten fresh, preserved in jams or fermented to make alcohol. I heard stories of the local doing all of these in Bulgaria. It forms a multiple stem trunk and after 30 years is only 15-20 feet tall but produces a remarkable quantity of fruit. It is in the dogwood family which gives it an inherent beauty with it’s deeply ribbed leaves and fall foliage making it agreat edible landscaping plant to extend the season of both fruit and flower. The genus of amelanchier should be a widely utilized edible landscaping plant as it also belongs to the rose/ apple family of rosaceae. It boasts a tremendous clustering of white flowers all over the tree in early spring which is quite the site. The fruit then develops to a dark blue/purple color and are a great substitute for blueberries especially in the alkaline and heavy soils like in Cincinnati, Ohio, USA where I grew up. The fruit are subtly sweet and are medicinal and a traditional addition into the dried fruit and meat dish that the plains native americans relied heavily on in North America: pemmican. Many varieties can be grown those only reaching 2m (6ft) or those reaching 9 m (30 ft). 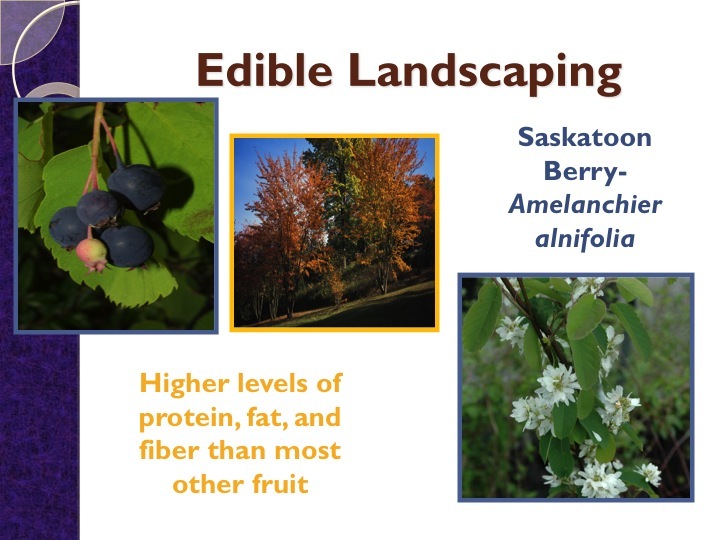 The tree is very abundant in fruit and flower with great fall foliage making it a great addition to the edible landscape. This small plant is making a North American revival after its export to Europe and cultivar improvement. 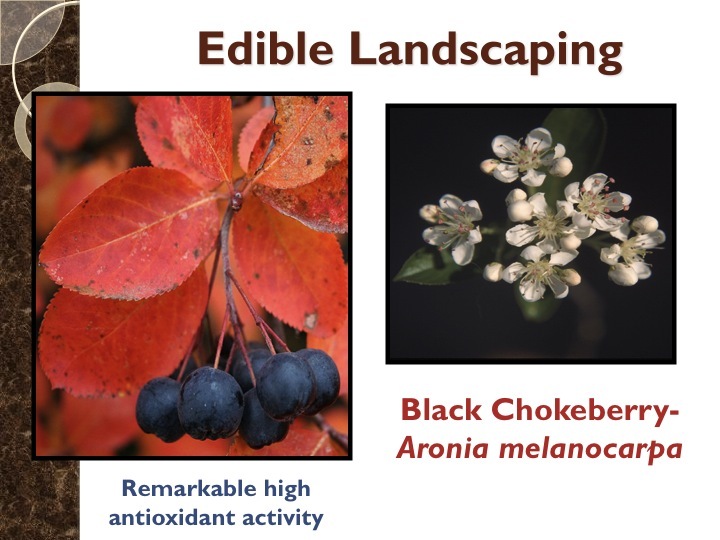 While the name isn’t the best marketing tool (that is why you might just encounter it as Aronia these days), it is super medicinal and a nutra-ceutical industry is popping up around it similar to Acai or mangosteen from the tropics. However, this is a temperate fruit and grows well next to rain gardens or on the mounds of swales. It can tolerate wet conditions and produces small clusters of white and fragrant flowers in the early spring. The dark purple berries then develop and give lots of medicinal not yet great tasting berries. They can be juiced with other sweet fruits or imagine the medicinal quality when eating them and enjoy. 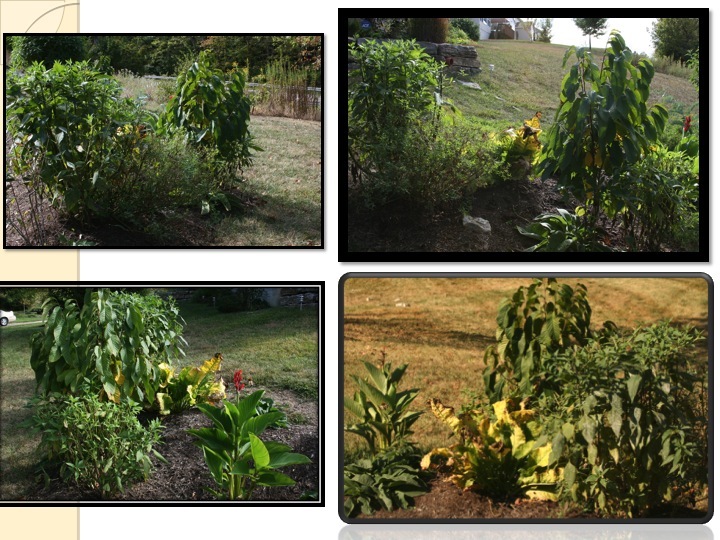 This plants foliage also turns bright red in the fall which allows it to be a front and center plant in landscaping. Finally, the flavor and aroma of kiwi fruits are enjoyed by many around the world. 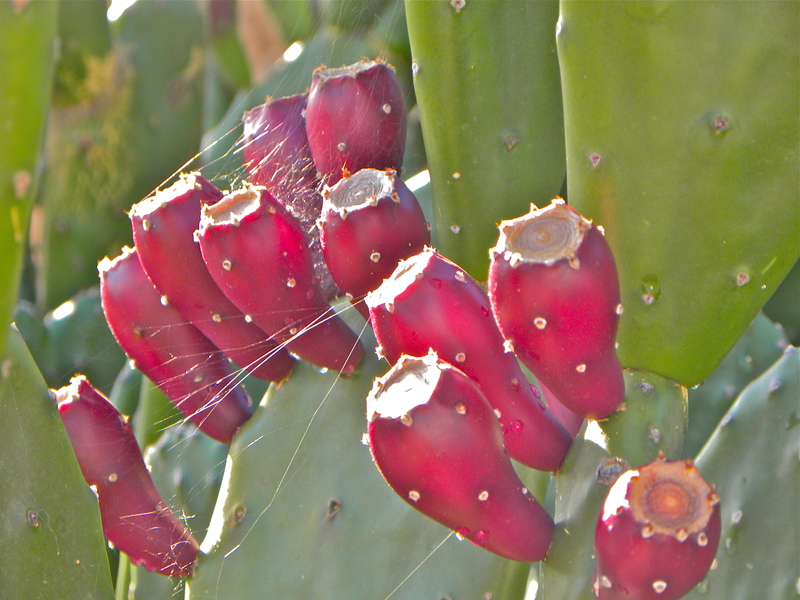 However we often export them from Chile, New Zealand, or Italy where their mediterranean climates support these fruits. However, in the temperate regions the hardy kiwi can be grown on trellis’s to support its vining habitat. It also produces delicious fruit from its fragrant white flowers. Alternatively this one is eaten like a table grape thus requiring no peeling. It grows slowly initially and does require both male and female plants for pollination. However, once it does start to fruit be ready for a heap of them as I have seen 30 year old vines simply dripping in Iowa, USA. The old-time farmer took them to market but in Bulgaria they often ferment them into a wine. There are many cultivars these days and the nutrition value is superb. 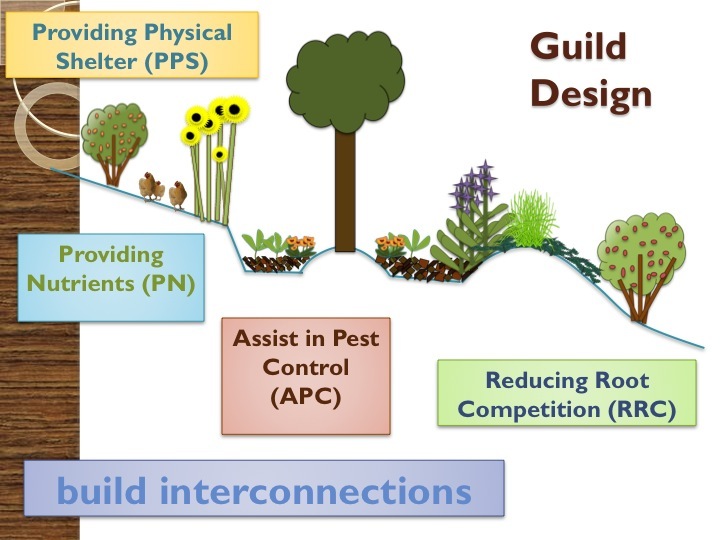 Guilds build on this principle of diversity through providing structure to our designs of how we organize plants. We msut realize and observe how nature uses certain plants to fulfill certain functions and then build off of this inherent design. The picture below depicts a natural grove of plants in a garden at Permaship in the Balkan foothills in Bulgaria. 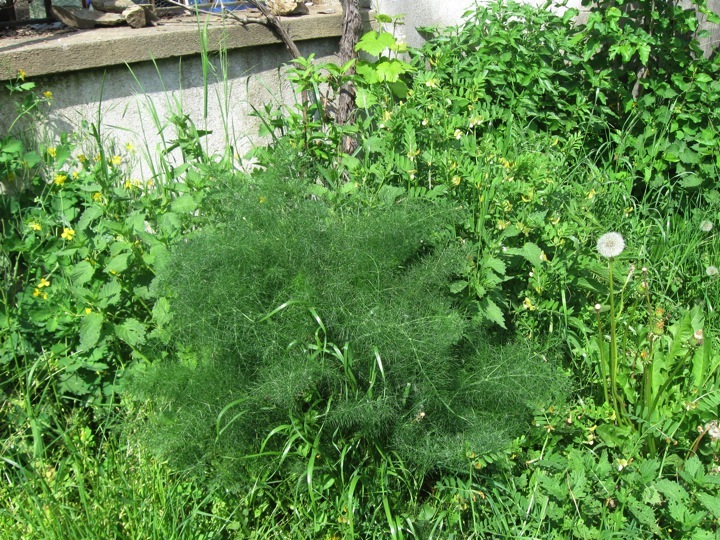 It shows how nature arranges regenerative plants such as the deep tap rooting Dandelion in the aster family, the nitrogen fixing vetch in the legume family, the dynamic accumulating Stinging nettle from the mint family, and finally the perennial fennel attracting beneficial insects from the Umbel family. There is no seen competition, rather the plants attracting different minerals for the health of the overall ecosystem and providing order in the chaotic zone of regeneration of an abandoned part of a garden. They repair and balance through attracting beneficial insects and other flora and fauna above and below the soil line. Other herbs and grasses and scattered about but it shows many of the functions and plant families we are looking for when we construct guilds in a permaculture context. The main concept behind guilds is that you have one central element and you build a micro-ecosystem to reduce entropy of the sytem and connect functional interrelationship across varying life kingdoms. We employ the ideas of using multi-functional plants, stacking in space and time, and use biological resources to create harmony. 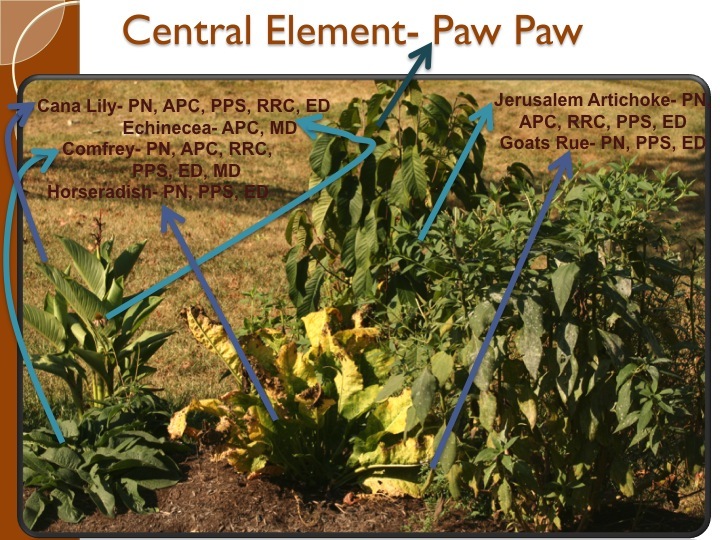 Thus around our central element such as a tree shown below from different angles being a Paw Paw, we arrange plants that enhance the growing conditions of the element. Each element by itself can be catapulted to a multi-function status by arranging the plants in relative location so that inputs and outputs interactions are maximized. conditions will yield a better result for the overall system. Guilds in the tropics may include plants such as winged bean, lemongrass, and peanut grass while those in the temperate world may include siberian pea shrub, egyptian walking onion, and clover. These both have the same pattern but are context and climate dependent. Guilds can be constructed cheaply through learning plant propagation techniques such as cuttings, layering, or root division and the dissemination of seeds. The sheer volume of plants that it takes to fill the guilds and make them multifunctional should be approached this way rather than buying all the plants from nurseries. Raising acacias by seed, taking cutting of lavender, and dividing comfrey is essential for saving money and cycling energy on site. Finally the above picture displays the spatial relationship of a newly formed guild. They will evolve over time as the central element grows and then the plant can be propagated. Developing nucleus’s and then moving on as the principle of small scale intensive suggests is vastly import. Stability is produced through diversity and its pattern is much more rhythmic than the opposing sterile, conventional, and chemical orchards. Great overview of these 2 important gardening strategies and their relationships. I like illustrations you made because it helps visualize what goes where, and the list of great plants most people dont know of. Ive found the companion planting chart helps with guilds so everyone gets along. 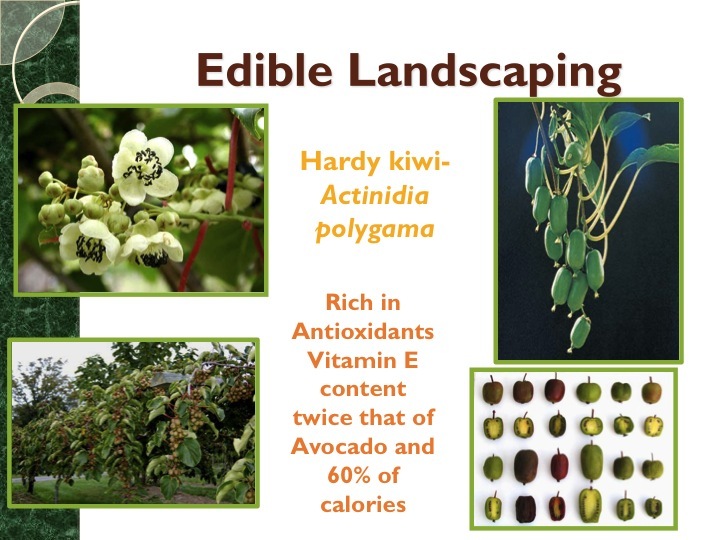 What a day it will be when all our yards and farms are dripping in beautiful edible abundance! To Permalution!! I usually start assembling a guild here in the subtropics by seeing the central element as the provider of main harvest and then seeing how I can support that harvest with the guild. I agree with the nitrogen-fixing plants as a prostrate groundcover. We get a lot of very, very weedy leguminous vines here that strangle trees. Legumes will compete for water but do help with nutrient, they generally are far less competitive than grasses as competition in the rootzone. 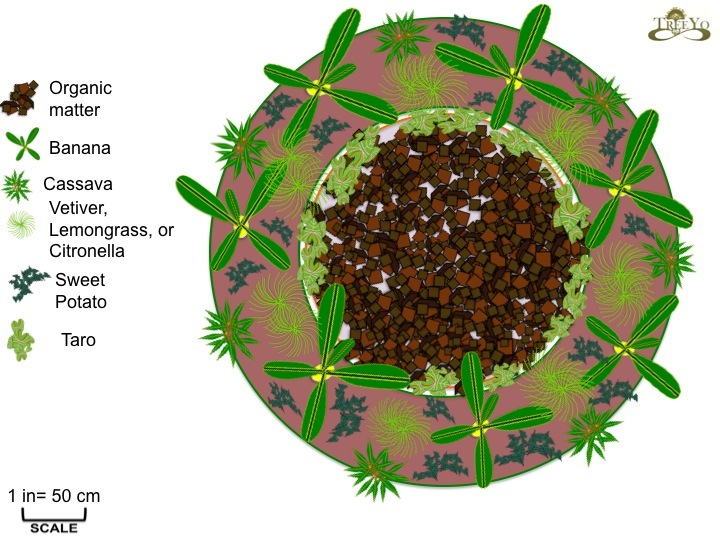 I use Wynn’s cassia, Pinto’s peanut and lotononis with clover and lucerne in winter. Comfrey seems to be the best deep-rooted nutrient cycler across a wide range of environments, it also is a very effective running grass barrier. Working out the major pest problems experienced by the central element leads to creative solutions. Fruit-sucking moths need insectivorous bats as a predator, so bat houses are part of a guild. Carabid beetles forage on fruit fly larvae so ‘rough mulch’ – logs, rocks and piles of twigs as habitat for the ground beetles become part of the guild. Flowers to encourage beneficial insects are probably part of all guilds but to be really effective you need year round nectar. Small insect-eating birds need water close by so ponds and birdbaths become part of the design. Thanks Frances this is exactly what we are planning on doing with our bio-diversity hedgerows in one of our projects in the Northern Part of Portugal which is somewhat sub-trpoical (citrus grow great). Mix of all sorts of elements to bring the balance. I mention many of those design features like Bat Houses or small ponds in the page I wrote on the Use of Biological Resources.Thanks for your contribution to the page. thanks for another excelent post! I was wondering if you have any suggestions to ou mediteranean climate here in portugal. We have very wet and cold winters (a few days of -5ºC) and very dry and hot sumers (a few days over 35ºC). Hey Fred lots of good permaculture in Portugal, south Africa, new Zealand, California, chile and the like with similar “west coast” climates. nonetheless in Sintra where we get a couple of degrees below zero this winter we use lots of lavender (3 cultivars), thyme, sage(s), oregano, boldo, and in the winter the mints grow well. they grow in the summer as well but with irrigation along with comfrey and cana lily. Other herbs include french sorrel, Jerusalem artichoke, clovers of all sorts, and all the other wilds we use for chop and drop like grasses and oxalis. We also use lemongrass irrigated and of course canas provides some shelter and cop and drop. we also use eleagnus as one of our other main woody shrub support species and have one other nitrogen fixer that is an unknown species. If you web search west coast forestry pdf you will find a great resource eh. thanks for the comment! But, since you didn’t mention anything about the central element, do you think you can say something about that? Any particularly native interesting species? 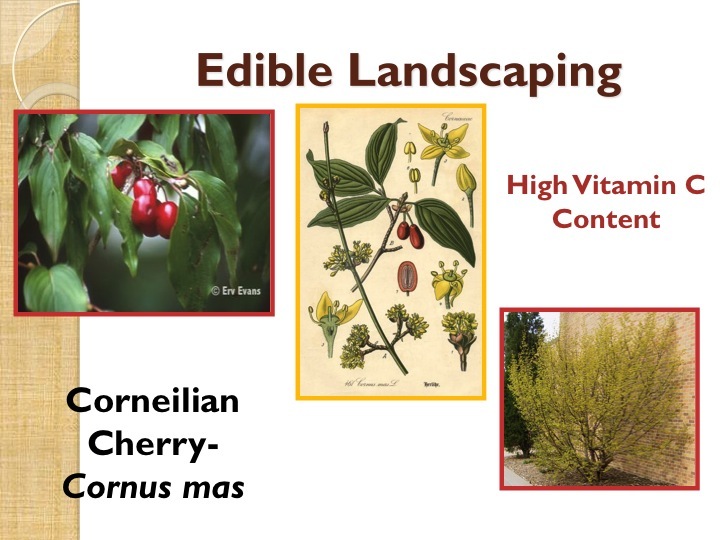 Well Native species could include madronha, strawberry tree, chestnut, or oaks. Those are most of the native species. Olives, figs, pomegranate, stone fruits, mulberry, grapes and the like are others but not sure of their exact origins within the mediterranean/ eurasian continent. Depending on your frost on site, citrus, feijoa, white sapote, and avocado are a few of that range as well.